It is imperative to understand that IT systems have become a supporting core of any business functions, and it could significantly take the growth of your business to a new level. People have started to modernize and digitalize their businesses, and it has immensely benefited them and their clients. 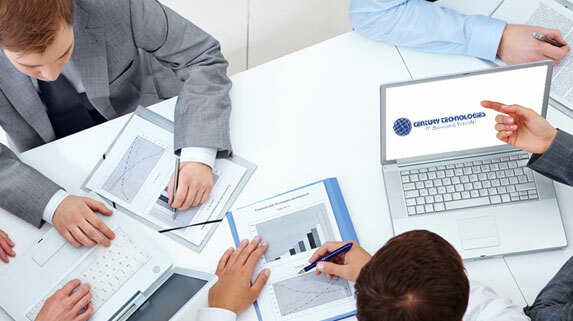 Century Technologies addresses the core of your business to implement excellent IT solutions. We excel at regularly managing networks and systems to maintain the functions and durability of the servers installed in your organization. Why Hire an IT Services Firm? When you implement IT services in your organization, you delegate work responsibilities to selected candidates, and it enables you to focus properly on managing your business. It assists you in exploring revenue generating opportunities and in achieving the goals of your business. Hiring the services of an IT firm allows you to benefit from given resources and it enables you to discover your capabilities as a business person. Century Technology provides a broad range of desktop management and servers that actively updates and manages your servers and computers remotely. We inspect each aspect of your networking system, and we provide IT support services according to the status of your system. Our team of qualified and trained technicians and engineers assist you in preparing a strategy that caters to your IT budget, and it also takes the current and upcoming technology needs into its consideration to maximize its objectives. Servers are highly receptive to crashes, and unexpected crashes can significantly affect the performance of your business. We employ an effective and practical server backup solution that incorporates an easy-to-use appliance which makes it easy for you to access your cloud backup, local backup, and object-level exchange store. Century Technologies is adept at virtualization, and it can instantly transform your business to a virtualized serve which significantly increases the flexibility of your systems which makes your IT system cost-effective and effective. It also enables you to strengthen your data security option. We offer virtualization for reducing the number of servers installed in your organization to save energy and costs. IT systems can become susceptible to spontaneous problems at certain occasions, and it could slow down the efficiency of your business. With Century Technologies, we will access the systems installed in your organization, and we will implement robust IT support to address the issues on their occurrence. I love my new CCTV cameras. I should have done this years ago. The installation was done professionally and in the time frame allotted. It was a great experience. Great service. They really helped me out when my cameras went out. They made the service and payment very convenient for me. I highly recommend this company.